Live commentary audio links: first half, first half of first point of second half, most of second half, last 12 minutes of the game. Scandal receives going upwind to start the game. This must have been a conscious decision by Scandal, but it resulted in them getting broken right away, although their O line did get practice working upwind on the first point. 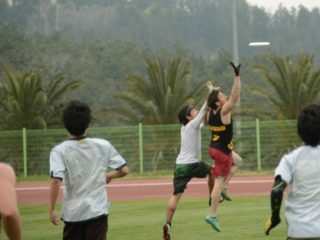 Scandal played a lot of zone, but Riot never bothered to work the disc against it, instead using Alyssa Weatherford’s huge throws to get the disc downfield, either to receivers Cardenas and Craley, or to punt and play the field position game. Weatherford threw plenty of big around forehand break hucks, but Scandal’s zone forced their deep deep, Sandy Jorgensen, to cover the targets of Weatherford’s backhand hucks down the sideline and her forehand hucks to the opposite sideline, and when Weatherford could get a flick break huck off – or an inside out high backhand huck, which she threw several times, Jorgensen was at the mercy of the wind. If the wind pushed the throw down or made it float, Scandal would get the disc. But several times those throws would hit Cardenas or Gruver and Riot would get an easy downwind score. 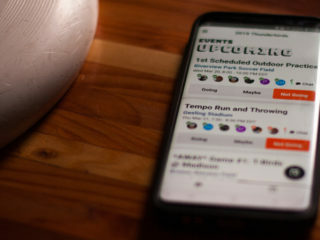 Riot, several times, would stack their upwind D lines with seven players who could throw upwind hucks, generally Rohre Titcomb, Caitlin Cordell, Kate Kingery, Sarah Griffith, Hana Kawai, Shannon McDowell, and Dominique Fontenette. 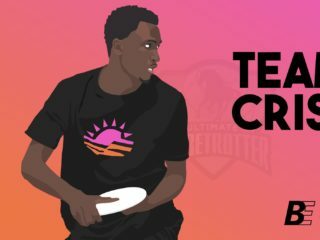 Since it takes two upwind huck completions in a row to score an upwind goal, these lines from Riot could rely on cutters throwing hucks to cutters, instead of waiting for a handler to follow their throw and receive a dump before hucking again. It was very effective, especially on Riot’s upwind break to win the game at 14-13. Scandal did a great job denying Rohre Titcomb any backhand throws. Her backhand huck upwind was extremely dangerous all weekend, and her low around backhand breaks could set up Riot’s other throwers with unmarked huck looks if she completed those throws. Charlie Mercer did a great job marking Titcomb all game, forcing Riot’s other throwers to beat them. In particular, Mercer had a fantastic layout point block on a Titcomb backhand break in transition. Titcomb was running the disc up to the endzone line after a Scandal turnover, with Mercer trailing her, and Mercer had a full extension layout D Titcomb’s throw. The game ended on an upwind break from Riot. Titcomb’s backhand huck sailed just a little too far for Fontenette, and Jenny Fey brought the disc in on the endzone line for Scandal. But Hana Kawai came up huge with a monstrous point block on Fey’s backhand huck, and Kate Kingery acted quickly and flipped the disc to Kawai. After an up/down call went to the observer, the goal was upheld and Riot won with a final score of 15-13. It was a joy to watch Weatherford use the wind on her downwind throws. Aside from her hucks, one great moment was a goalline scoober she threw to the breakside against a backhand force, and Heidi-Marie Clemens made a nice layout catch for the goal. For both teams, one of the keys to the game was getting the disc to the break backhand sideline going upwind. Both teams forced forehand on the squad going upwind and tried to deny break throws to the backhand side. If one of those throws did go off, it was a great backhand huck opportunity (cutting through the wind easier than a forehand) or breakside continuation opportunity for big yards. Neither team was able to get much breakside flow going in this game, although Fury showed its effectiveness in the second half of the finals. This game started an hour after the Riot-Scandal semifinal and ended only 5 minutes after. At 15-13 Riot, it was 13-4 Fury. Fury rolled over Showdown in this game (15-4) in large part due to their upwind offensive efficiency. Showdown had a tendency to tunnel in on open-side cutters going downwind, ignoring break throws and dumps, leading to lots of turnovers when teams like Fury and Molly Brown fronted cutters. Alex Snyder was throwing upwind at distances of 30-40 yards as if there were no wind, and not just on open-side throws. She had some phenomenal breaks going upwind that led to huge yardage gains for Fury. While Showdown showed the ability to score upwind all weekend, their lack of success scoring downwind, combined with their poor defense going downwind, meant that Fury was able to score upwinders without much trouble. Phoenix and Showdown traded upwind O points in pool play, which is perhaps an indictment of Showdown’s defense going downwind more than anything else.